Compiled by his daughter, Robyn Randall. Olaf was born in London 1925, and spent the first five years being raised on a tea plantation, named Kadallar, on the slopes of Anamudi Mountain in the Cardamom Hills in Southern India. Today this is known as the High Range in the State of Kerala. His parents, Cyril and Gertrude John, parted company when Olaf was age one. The life on the mountain was harsh and was very hard for the debutante wife used to the London social life, and for the War World I hero who had to leave the house very early in the morning to organise the tea-workers and returning late, only to do paper work into the night. Olaf was the youngest of three boys but did not meet his older brothers Alan and Ivan until he was three. When the boys came of age to attend school they were sent off to a Missionary boarding school in the Nilgiri Hills of south-eastern India, then two years later they went on to Haddon Hill in Ceylon, which was to be a much kinder environment. Olaf came to New Zealand in 1935, aged 10, with his father and two brothers. The boys were placed in Waitaki Boys High in Oamaru as boarders, with the intention that Cyril would immigrate to New Zealand when his tenure as a Tea Planter was concluded. Unfortunately, this did not eventuate due to World War II breaking out. This and other circumstances meant Olaf did not see his father for 27 years. From school, Olaf joined the Airforce, and went into the flying school, but as events changed, he swapped over to the Marine Section, and spent most of his World War II time sailing around the Pacific Islands looking after flying boats and equipment. When the War was over Olaf trained as an art teacher, and gained a Certificate in Education, where he taught Art all around New Zealand as part of the Arts and Craft branch. 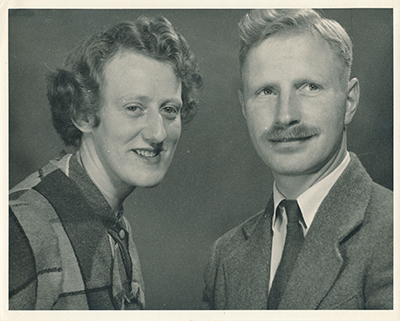 When Olaf was about 25 he met his future wife Daphne Fletcher in the pouring rain during a tramping trip into the Tararua’s to the Allaway Dickson hut. At this time Daphne was a university student at Victoria University studying Economics. In 1954, accommodation was scarce in Wellington. Olaf and Daphne married in March and had been promised a flat in town. When they returned from their honeymoon, the accommodation had fallen through. One of their friends had a contact in the Wellington City Council, and suggested they speak to him. They did, and were told about an upcoming vacancy in the Halfway House in Glenside. It was to be a shared abode with another family, the Richardson’s. The Richardson’s resided in the back half of the house, and the vacancy was to be the front portion. With this news they were really excited to view, and jumped on Olaf’s Velocette motor bike, nicknamed Bab’s, and rode all the way out to Glenside. Despite the day being extremely cold and bleak, they were just so grateful there was a place to start their married life together and signed the lease that day. Olaf and Daphne moved into the Halfway House in May 1954, after the Webb’s, who were living in the front part of the house, departed. The house was built for a northern hemisphere positioning on the property, which meant the house faced away from the sun. Olaf and Daphne’s part of the property was surrounded by red currants, which took in the sloping front lawn down to the creek. Inside their part of the house, when you entered the front door the kitchen was placed off to the east side of a short corridor. The kitchen was sparse with a sink and wooden bench placed under the windows with an electric stove to the left. The view from the window looked across the wooden veranda, and down to the creek. On the other side of the small corridor was the medium sized lounge / dining room with the windows facing out to the lawn, open fire place, with bare wooden floor boards. When they moved in, they had very little. Olaf had a gate-leg table, and they acquired two large butter boxes and cushions to cover the boxes. The butter boxes invariably needed to be replaced after Daphne’s father Tom Fletcher came to visit. Tom was a tall man, of solid stature. He was a Maori school inspector, a rugby referee, and a keen lawn bowls player. Olaf and Daphne also had two rooms upstairs. At the top of the stair case, the bathroom was directly in front of the landing, with their bedroom to the right. The bathroom was basic with a bath, toilet, sink, with wooden floor boards. The bedroom again had bare wooden floor boards, which made it very cold in the winter months when the sun was limited. The winters down Glenside were harsh, and it was not too uncommon to wake with frost or ice on the inside of the windows. In their second winter, it got so cold that it split the cylinder head on Olaf’s Velocette, despite it being parked under the veranda. Luckily Daphne’s brother-in-law was able to fix this with araldite glue, a product which was new to the market then. The Glenside community was very tight, and everyone knew everyone. Olaf and Daphne were both working during the week and would often go on weekend tramping trips. Therefore, they did not get to see as much of their neighbours unless they were home in the weekends. As Glenside was deemed out in the country in the 1950’s, it was not too uncommon for Olaf and Daphne’s friends to come and stay for the weekends. Due to most not owning their own means of transport, they would catch the train out to Johnsonville and walk down Middleton Road laden with their pack and sleeping bags. At night the lounge became the sleeping dorm, after lots of debating and eating before-hand. During the days they would go for walks up in the surrounding hills. There was a big old gold mine, which was high in the western hills. Daphne was not so keen, as it was full of weta’s. Olaf on the other hand, would carry his camera and capture the scenes. In autumn, they would go roaming around the local hills for mushrooms, late summer would be blackberries and red currants. Quite often, they (well Olaf) would tickle trout from the creek, - oh, and the men from Downers used to catch the eels. One would get milk in a billy from the local dairy farm (the Taylors), and eggs from the Pender family. 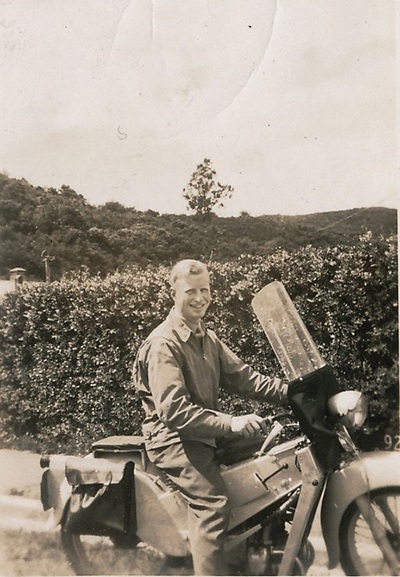 Daphne related that she would do their grocery shopping in her lunchtime in town, and on one occasion Olaf’s Velocette, Babs, could not cope with her and the groceries going up Ngauranga Gorge, so they had to catch the bus home, and Bab’s had to be towed home. On another occasion returning from a holiday, Olaf and Daphne had found that the ceiling wall paper bulging above the front door. The paper was full of water from a leak in the bathroom. When the wall paper gave way they had a very wet entry, and it seemed to take for ever to mop up and dry out. In early 1956, Pam and Ian MacLean moved into the Halfway house sharing with Olaf and Daphne until the Richardson’s moved out, then the MacLean’s took over their portion of the house. As Olaf was a keen animal lover, Pam’s cat used to seek him out. For Easter, Pam went and got another little grey farm kitten, Tish, for Olaf. Tish became a much beloved member of the John family and lived to a grand age of 18. As a small kitten, Tish was introduced to all their friends by travelling down Daphne’s jacket on the back of Babs. This chapter in their lives came to a natural close, when Olaf and Daphne found another flat, in Khandallah, and moved out in late 1956.